We have an extensive beer selection with craft, micro and old world brews from many of the world's top brewers including many from Pennsylvania. Our craft lineup includes seven taps that change at least weekly and often feature seasonal offerings. 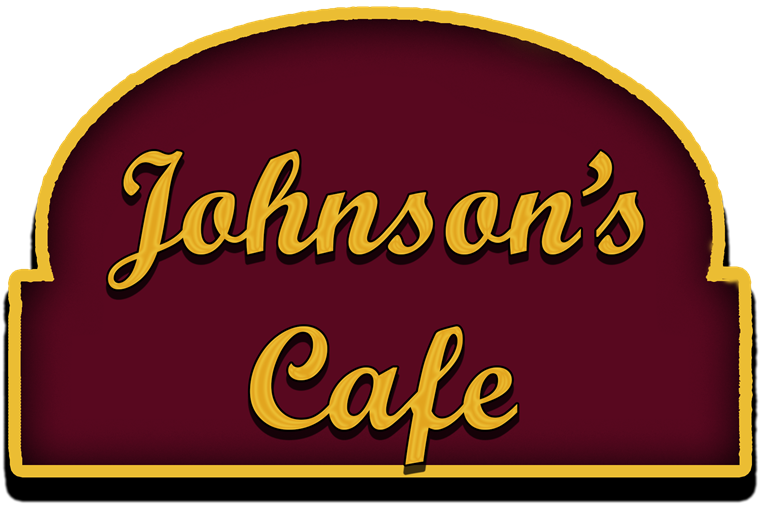 Johnson’s Café can handle all of your catering needs. Call us with your date and we will be happy to try to accommodate your needs, including customized menus. Let us show you how easy it can be! We will be serving Easter dinner from 11am to 3pm. Reservations are not required, but suggested. All dinners served with choice of salad and side dish, house vegetable, rolls and butter and choice of dessert. Grilled chicken served on chopped romaine shaved Parmesan cheese and your choice of grilled shrimp or chicken. Grilled boneless chicken breast on spring greens with sliced oven roasted beets, bleu cheese and caramelized walnuts tossed with champagne vinaigrette. Teriyaki glazed Yellowfin Tuna steak and mixed vegetables on romaine with Cusabi dressing. Your choice of wing sauce with blue cheese dressing. Choose traditional crunchy or grilled chicken. Roasted chicken on spring greens with smoked almonds, dried cranberries, mandarin oranges and blue cheese & cranberry citrus vinaigrette. Pulled roasted chicken breast on spring greens with diced egg, bacon, avocado, tomatoes and bleu cheese crumbles with our home made Cobb dressing. Fresh baby spinach tossed with a home made orange poppy seed dressing then topped with grilled chicken breast, diced avocado, feta cheese, toasted almonds and dried cranberries. Caramelized fresh pears and walnuts with grilled chicken, bleu cheese and spring greens tossed with a Champagne Vinaigrette. Our sandwiches are served with chips, vinegar slaw and a pickle spear. Substitute our regular skin on fries or fresh fruit for the chips for only $0.99. We will make a wrap out of any of our delicious sandwiches, just let your server know! We use garlic-herb wraps. Half pound of fresh locally ground beef grilled to order and you choose the toppings you would like added. Half pound locally ground burger topped with Bacon Jam, lettuce, red onion, tomato and blue cheese crumbles served with onion rings. Grilled fresh chicken breast served on ciabatta with with chipotle aioli, jalapeños, applewood bacon, lettuce and tomato. Chipped rib eye or chicken and white American cheese on house baked roll. Served on your choice of Farmhouse White, Seeded Rye or Wheat Berry Blend. A monster of a sandwich, freshly breaded haddock on a grilled French roll with lettuce, tomato and tartar sauce. Grilled pastrami or our oven baked turkey breast and Swiss on rye with kraut and 1000 Island dressing. On your choice of Farmhouse White, Seeded Rye or Wheat Berry Blend. Our house baked ham and turkey with bacon, Swiss cheese, lettuce, tomato and mayo on a toasted brioche roll. Seasoned grilled chicken breast on a toasted brioche roll with bacon, lettuce and tomato. Our roasted turkey, bacon, avocado, lettuce and tomato with a spiced aioli in a garlic and herb wrap. Fresh Asparagus hand battered, fried and served with a lemon dipping sauce. House made chips with blue cheese sauce, apple wood bacon crumbles and scallions. Half-pound of mussels in a creamy Parmesan sauce with garlic ciabatta bread. Our own tater tots made fresh with fresh jalapenos and shredded cheddar-jack cheese deep fried and served with our ranch dipping sauce. Home made did served with tortilla chips. Hard cooked egg wrapped in Country Sausage then breaded and deep-fried and served with house made mustard dipping sauce. Artichoke hearts baked in butter with bacon, provolone and mozzarella. Large wings served with celery sticks and choice of our own blue cheese dressing or house made ranch dressing. Grilled boneless chicken breast on spring greens with dried cherries, candied pecans, bleu cheese crumbles and sweet potato fries served with cranberry vinaigrette. Roasted chicken on spring greens with smoked almonds, dried cranberries, mandarin oranges and blue cheese with cranberry citrus vinaigrette. Black Angus Shoulder Tender with asparagus, crab meat and bleu cheese sauce. Our delicious meatloaf filled with our macaroni and cheese, wrapped in bacon and served with mashed potatoes and gravy. (Please note that beef rib eye steaks tend to have heavy marbling and an "eye" in the center with a tail and perimeter fat. These characteristics make this a juicy and tender steak). 8 oz. Black Angus filet. served with candied sweet potatoes. Braised Broccoli Rabe and Mozzarella Chicken Sausage sautéed with and served on bow tie pasta with basil pesto drizzle. Chicken sautéed with mushrooms, artichokes, capers and sun-dried tomatoes finished with creamy Marsala sauce served with linguine. Roasted turkey with home made stuffing and real mashed potatoes with gravy and home made cranberry sauce. Ahi Tuna with pistachio and tuxedo sesame seed crust then gently sautéed and served on a pool of creamy caper sauce. Wild Alaskan salmon topped with horseradish-parmesan breading, broiled and drizzled with Dijon cream. The local favorite whitefish served broiled or fried. Our own crab cakes broiled with lemon, butter and white wine. A giant platter of broiled haddock, shrimp, sea scallops and a crab cake. Sea scallops pan seared in herbed butter served with pesto. Sweet bay scallops and shrimp tossed in a scampi sauce with angel hair pasta and shaved parmesan cheese. We offer Gluten Free Sandwich Rolls for our sandwiches and Gluten Free Fettuccine for our sauté entrees. Please let your server know if you would like either of these options. Gluten free pasta filled with roasted chicken, kale and ricotta cheese tossed in a fresh roasted red pepper cream sauce. Grilled fresh chicken breast served on ciabatta with chipotle aioli, jalapenos, applewood bacon, lettuce and tomato. Weekly Lunch Specials Available Monday through Friday 11:00am until 2:30pm. Chicken cheese steak with sweet peppers and onions on a large salad with ranch seasoned fries. No Substitutions please. Double IPA that pays homage to the hop. Unfiltered and abundantly hoppy, the hophead Holy Grail ! CA hop monster, over 100 IBUs! A portion of the sales of Last Chance IPA goes to small animal rescue organizations. Have one and help the cause! All banquets must have a deposit and signed contract. Groups of more than 15 wishing to order from the dinner menu must get prior approval and may be required to use a limited or prix fix menu. Special, customized menus are available. Please make an appointment to discuss your banquet needs. While we do have seating for up to 75, please check for availability. A deposit of $300.00 is required to book your event. This amount includes a non-refundable $150.00 deposit that will be deducted from your final bill, a $100.00 room fee and a $50.00 cleaning deposit. If the room can be cleaned using only a vacuum cleaner, the cleaning deposit will be returned. If we must clean food that has been ground into the carpet, etc. then the deposit will be forfeited. 7. Banquets of less than 15 may have two entrée choices, 15 to 40 may have three choices and banquets with over 40 guests may have four choices. All buffets must be for at least 20 guests and buffets may not be available on weekend nights. All banquet entrees must be preordered. Please note that the count on each entree choice must be at least 5. Vegetable, dessert and potato choices for plated entrees will be the same for all guests unless otherwise approved. On premise events will be furnished with white tablecloths and red napkins. Other colors are available and may incur an additional charge if unavailable from regular supplier. Menus must be finalized 21 days in advance. Final counts must be given seven days in advance and those numbers will be the minimum billing numbers. If your guests do not show, we will package their meals to go for you. Decorations are permitted; however, we do not permit the use of foil or paper confetti and will add a $50.00 cleaning charge for its' use. Thumbtacks and tape are not permitted. 12. Full payment is due upon completion of your function. Deposits will be deducted from your bill. All food and non-alcoholic beverages will subject to a 6% state sales tax and all food and beverages will be subject to 20% gratuity. Payment may be made with cash, personal check or credit card. We accept Visa, MasterCard, American Express and Discover. There will be no split checks for banquets and caterings. Cash bar is available with the host guaranteeing payment, but all food will be on one check. Please note that the prices contained in this menu are for on premise events and those to be catered off premise will carry different prices that reflect the additional costs involved. We will do our best to handle all details and special needs. There may be times when our patio is available for your event. If interested, please inquire. Dinners on this page are served with choice of starch, vegetable, tossed salad or cole slaw, rolls and butter, dessert, and coffee, tea, soda or iced tea. Choose two salads and two sandwiches for only $15.50. Coffee, tea, soda and iced tea are included. Choice of Chocolate Cake with Peanut Butter Icing or Carrot Cake included. Groups larger than 50 may make three selections from each category. Broccoli, Celery, Carrots, Cauliflower, Green Peppers and Ranch Dip. All made fresh in our kitchen - never out of a bucket! Dinner Buffets on this page include Tossed Salad, one vegetable choice, one potato choice, dessert, coffee, tea, soda and iced tea. Additional potato or vegetable choices may be made for an additional dollar per person. Minimum of 50 - $1.75 each. Minimum of 50 - $1.50 each. Price may be higher in some seasons. We cannot guarantee any medium well or well done steak. We cook our tuna steaks rare to medium rare and our salmon medium to medium well, we will cook them more but we cannot guarantee the quality. Tables of 8 or more will have 18% gratuity added. Some salad dressing and extra portions of dressings may incur an additional charge. Consumption of raw or undercooked foods increases your risk of food-borne illness.